DNA testing confirms Haitian couple are parents of baby sent to U.S. 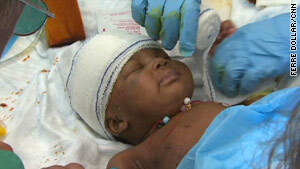 This infant was rescued from the rubble left by the earthquake in Haiti and taken to Miami for medical care. Miami, Florida (CNN) -- The parents of an injured baby girl who was flown to Florida for treatment after Haiti's earthquake have been told what they already know: They are the biological parents of the little girl. The International Red Cross notified Nadine Devilme and Junior Alexis in Haiti that DNA testing proves that the infant is theirs, said Mark LaPoint, an attorney representing the baby. Rescuers dubbed her Patricia, but her parents call her Jenny. On Wednesday morning, Miami-Dade Circuit Judge Cindy Lederman decided that Jenny's parents will get to take her back to Haiti after doctors and nurses in Florida finish treating her. "This is a case where these were really good parents, and I can't wait for these parents to be reunited with their baby," the judge said. "This is one happy day." Federal authorities have pledged to help Devilme and Alexis travel from Haiti to the United States to reunite with their daughter, though the timing of that trip has not yet been determined, said Bob Martinez, an attorney for the parents. The baby still has a hard time closing her left hand and needs some medical therapy, LaPoint said in court Wednesday. Video: Haitian baby really an orphan? The judge scheduled a hearing for April 7 to get an update on the baby's condition. Jenny was 4 months old when the January 12 earthquake destroyed large swaths of Haiti. Her mother was knocked unconscious in the 7.0-magnitude temblor and taken to a hospital. When she awoke, she urged her husband to go home to search for their baby. Alexis searched through the broken rubble for four days, but found nothing. The couple says that on the fifth day, January 16, witnesses saw a cleanup crew rescue Jenny from the rubble. She reportedly was found in the arms of her baby sitter, who was dead. The witnesses got word to Devilme, who was in the hospital with her own injuries. Rescuers apparently assumed the baby was an orphan and whisked her away to a different hospital in Port-au-Prince, one run by the University of Miami and Project Medishare, where a team of pediatricians worked desperately to keep her alive. With several broken ribs, the baby was having trouble breathing. The doctors stabilized her, and a few hours after the baby's rescue, a United Nations truck took her to a plane that was minutes away from leaving for Miami, Florida. "I told the ambulance driver if she got there in time, we'd name the baby after her," says Dr. Arthur Fournier, a University of Miami physician working at the hospital. The driver, Patricia, did make it on time, and thereafter, doctors at Jackson Memorial Hospital in Miami referred to the infant by that name. Devilme says the friend who told her of Jenny's rescue didn't know where the baby had been taken. By the time she found out , the baby had already been flown to Miami, Devilme says. Devilme and Alexis say it was "God's will" that Jenny went to Miami, as she might not have survived if she'd stayed in Haiti. Jenny was discharged from the hospital and is living in foster care in Florida. Her parents are living in a tent city in Port-au-Prince and recently had the DNA testing needed to prove the baby is theirs. The DNA tests have taken more than a month because of logistical difficulties getting the test to Haiti and because of a legal dispute over whether the baby should become a ward of the state of Florida or a ward of the U.S. government, says Mark Riordan, a spokesman for the Florida Department of Children and Families.